The onboarding equation is simple. For new hires, reinforcing why they joined your company requires inspiration and the support they need to bring their ambition to life. For companies: Successfully engaging your new hires results in substantial productivity increases, long-term engagement, and retention benefits. Move beyond traditional onboarding. 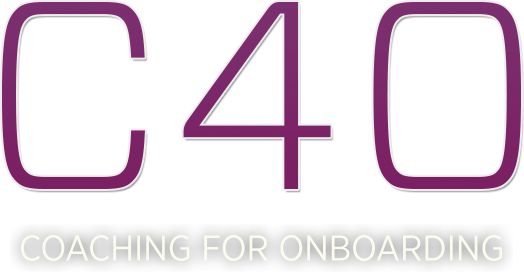 C4O (Coaching for Onboarding) is the most powerful new employee onboarding solution available. C4O combines scalable technology with personal coaching resulting in increased new hire retention and productivity. The C4O Onboarding experience focus on the competencies critical to new hire success: Goal Achievement, Organizational Awareness, and Partnering and Relationship Building. The activities that compose the new hire integration roadmap are seamlessly integrated into the day-to-day life of the new hire as activities and behaviors that any successful new hire should be performing as part of their job. C4O accelerates a new employee productivity, and retention, and builds a lasting foundation for success in their role. Combining the guidance of a real coach with the scalability of weekly online content, your new hires will have the roadmap and resources for success. C4O is the only onboarding solution that provides companies with a scalable technology, the right content, metrics, and high touch coaching. Live cohort coaching sessions provide real-time guidance, insight, and collaboration among new hires. 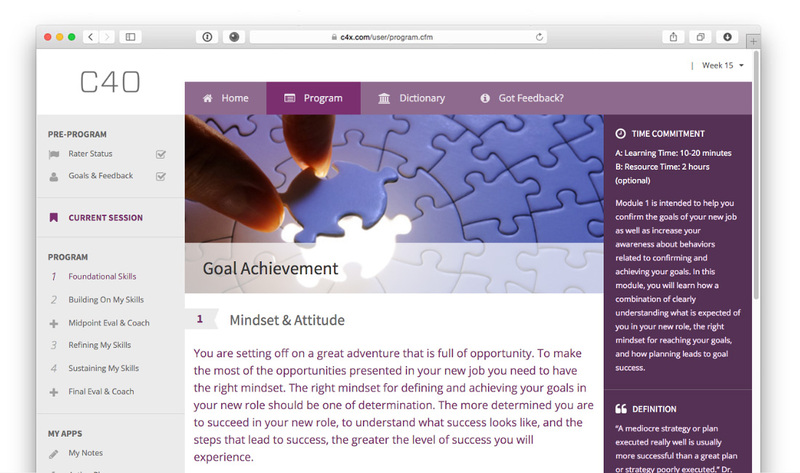 From day one, new employees have a customizable online road map for their success. They are empowered to hit the ground running, achieve their goals, build relationships, and thrive within the company's culture. Mid-point, post-ratings, and ongoing online feedback tools measure progress and track results. New employees and their managers know how they are doing - no surprises. Weekly customizable checklist items provide data to ensure new hires on are engaged and on the path to success. Through group coaching sessions, participants are guided on success strategies, behaviors that are relevant to their job and your organization. Group coaching sessions allow for knowledge sharing by new hires across the organization, which fosters community and relationship building.